Indian stock markets are still shallow, with power concentrated with a few brokerages on Dalal Street. At the peak of the market frenzy in early 2008, New Delhi-based stock broker Sanjay Agrawal was actually thinking of shutting shop. It was a tough call for the 44-year-old Agrawal who was part of the first lot of firstgeneration stock brokers awarded a broking licence by the newly set-up National Stock Exchange, or NSE, in the mid-1990s. Agrawal had launched his broking outfit, Mani Stock Brokers, with half a dozen employees at the bustling Nehru Place complex in the capital hoping for a big payback from retail broking. He paid Rs 50 lakh for the membership but found the going tough. "The margins were too low to sustain the business," recalls Agrawal. Fortuitously, he punched his last order on the NSE and folded up operations just three months before the Lehman Brothers collapse in September 2008. That belly-up sent the global markets into a freefall, dealing a body blow to the broking business in India. Agrawal did not exit the markets completely though. He soon teamed up with leading Mumbai-based broking house Motilal Oswal Securities, where he is a director now, and, today, considers himself lucky for being part of a bigger broking franchise. Agrawal is among the growing tribe of brokers who are finding the business unsustainable, hit by a double whammy of falling margins, and high people and infrastructure costs. Today, brokerage rates are as low as 5 to 10 paisa per Rs 100 trade done, hammered down by growing competition among the players, and rapid scaling up is critical to stay afloat. The option for many small brokers is to either shut shop or consolidate. 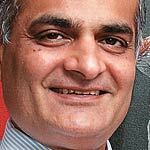 "Scale is an issue because of a highly fragmented market," observes Rashesh Shah, Chairman of the Edelweiss Group. Shah, who started as a broker around 15 years ago, has managed to create a diversified financial conglomerate with interests in broking, asset management and credit. But it is becoming increasingly difficult for smaller brokers to sustain highquality research teams and also manage the rising infrastructure costs that the fast-changing trading technology entails. Then there are compliance issues as well. Take, for example, the arbitration costs for brokers. In a dispute between a broker and investor, which is quite common, the entire cost of arbitration is borne by a broker, eroding the wafer-thin margins further. It is a market where the big boys call the shots. Of the 8,500-odd brokers on the two leading bourses, a select group of top 100 control 77 per cent of the cash market turnover - it was just half in 2000-01. The remaining 8,400, are then fighting for crumbs and account for only about 20 per cent of the turnover. Now here is some more perspective. Stocks in the 30-share BSE Sensitive Index, or Sensex, account for 40 per cent of the market capitalisation. The top 100 companies stack up to a staggering 70 per cent of the market value. And the weakest link: the near absence of retail investors. According to demat data of the National Securities Depository Ltd or NSDL and the Central Depository Services (India) Ltd or CDSL, the market has a retail investor base of two crore - a small fraction of India's burgeoning population of 120 crore. Broking houses put forward a more credible figure of 30 to 40 lakh active retail investors. "There are many who compare the growing mobile subscribers' base to investors' base. But mobile is more of a need or a necessity," counters Gagan Rai, Managing Director and CEO, NSDL. "It is also a function of education and comfort," believes Shah of Edelweiss. Maybe that is the reason why 58 per cent of household savings end up as bank deposits, and only 3 per cent go into equity investments. Says Anup Bagchi, Executive Director at ICICI Securities: "Retail investors are drawn to safe-haven assets." Even domestic institutions, especially mutual funds, have been playing second fiddle to foreign institutional investors. 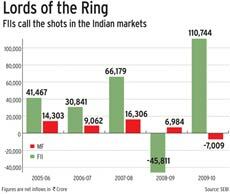 FIIs, who are today two to three times larger than domestic institutions in terms of net investments in the Indian equity market. "Domestic institutions will catch up in the next three to five years," predicts Shah. The Indian stock markets, then, have not matured yet and are still going through a transitional phase, say analysts. To be sure, most analysts concur that systemic reforms initiated by the Securities and Exchange Board of India, or SEBI, in the last decade, especially after the Ketan Parekh scam, have built a sound foundation for the markets. Indian markets have done away with the opaque badla or the carryforward system and replaced it with a daily rolling settlement cycle. Today, all positions are settled two days after the transaction or on a T+2 basis. In addition, India now has a vibrant futures and options market - one of the most liquid in the world - with retail investors accounting for 10 to 12 per cent of the turnover. The robust market infrastructure will catapult India into one of the most advanced stock markets globally - only, it will be a gradual process. Already, the NSE is the third-largest bourse in the world in terms of volume turnover. Says NSDL's Rai: "We have a large population entering the job market and the demographics also favour us." The biggest challenge now for the exchanges and SEBI is to enhance investor awareness, say analysts, even as the market regulator continues with reforms such as the introduction of physical settlement in derivatives and a shorter settlement cycle (T+2 to T+1). "We have to put the nuts and bolts for an effective foundation," says Bagchi. "There is an issue of throughput going into the stock market," sums up Shah of Edelweiss.